SHENZHEN, China, July 6, 2018 /PRNewswire/ — On July 5th 2018, the third China Merchants C Blue Training Program held its closing ceremony at China Merchants Port Plaza in Shenzhen. 25 participants from 13 countries across 4 continents along the Belt and Road graduated from the program. Deputy Secretary General of China Merchants Charitable Foundation (“CMCF”), Ms. Huang Yi; Chairman of Sri Lanka Port Authority, Dr. Parakrama Dissanayake; Associate Dean of Shanghai Advanced Institute of International Shipping of Shanghai Maritime University (“SMU”), Mr. Yu Siqin; and Deputy General Manager of China Merchants Port Holdings Company Ltd. (“CMPort”), Mr. Yan Gang, attended the ceremony. Ms. Huang extended her congratulations to all the trainees. She believes that C Blue has become a greater success with the joint efforts of all parties. Over a hundred years ago, China Merchants funded children from the Qing Dynasty to go to the U.S.to seek rejuvenation for China. Today, it invites the talents from various countries in the world via C Blue to share China’s development experience and achievements. Dr. Dissanayake regarded C Blue as a significant innovation where young people can nurture the friendships and mutual trust which pave the way for cooperation. He also appreciated the visions of C Blue that the trainees would contribute to the development of the Belt and Road in the future through a deeper understanding of China’s culture and development experience. Mr. Yu stated that SMU would fully utilize its faculty and regional advantages to promote C Blue. He believed the project is an important method of connecting different countries’ dreams of socio-economic development. On behalf of C Blue trainees, Mr. Kaan Anul from Turkey expressed his heartfelt gratitude to all and shared his understanding of the meaning of C Blue: “C” as the initial of “Culture Exchange”, “Communicate Internationally” and “Collaboration” conveys the values of the above words. Mr. Yan said that C Blue has been successfully held three times and has become a business card of CMPort. It has built a platform for talent from various countries and is a vivid portrayal of CMPort who dares to undertake historical missions and actively reacts to the “Belt and Road” Initiative. China Merchants C Blue Training Program Summer 2018, launched in Shanghai on June 12, is funded by the CMCF, co-organized by CMPort and Shanghai Maritime University. Since 2016, it has provided a series of high-end port and shipping training courses for young talent in the global port industry. 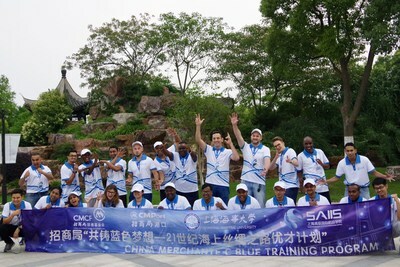 Trainees are able not only to learn theories of ports, shipping, and free trade zones, but also visit Chinese top companies in these industries, such as Shanghai Yangshan Port, Zhenhua Port Machinery Company, China Merchants Zhangzhou Economic and Technological Development Zone, Shekou Container Terminal, and China Merchants Bonded Logistics. The success of the C Blue has made the concept of the Belt and Road better known. 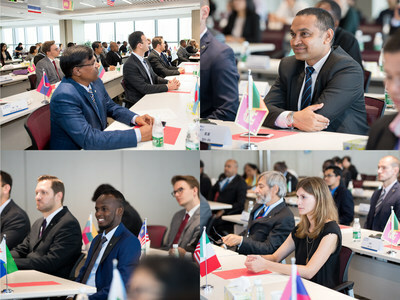 From the gradual transition of capital exchanges to management and cultural exchanges, it better explains the mission of the CMPort “We Connect the World.” It is believed that the trainees will apply their experience to the development of the port industry at home and jointly achieve economic and social prosperity of the Belt and Road. The next edition of C Blue is scheduled to be held in October 2018.